The Elgin American company has a long history of manufacturing watches and compacts. They started out as the Illinois Watch Co. of Elgin, Illinois in the 1880s. Their compacts date from the early 1920s and continue through the 1950s. The variety is astounding! They manufactured compacts for many of the famous cosmetic houses. Click here for a great history of the town of Elgin, Illinois. Evans was established as the D. Evans Case Co. in North Attleboro, Mass. in the early 1920s and manufactured compacts through the 1950s. 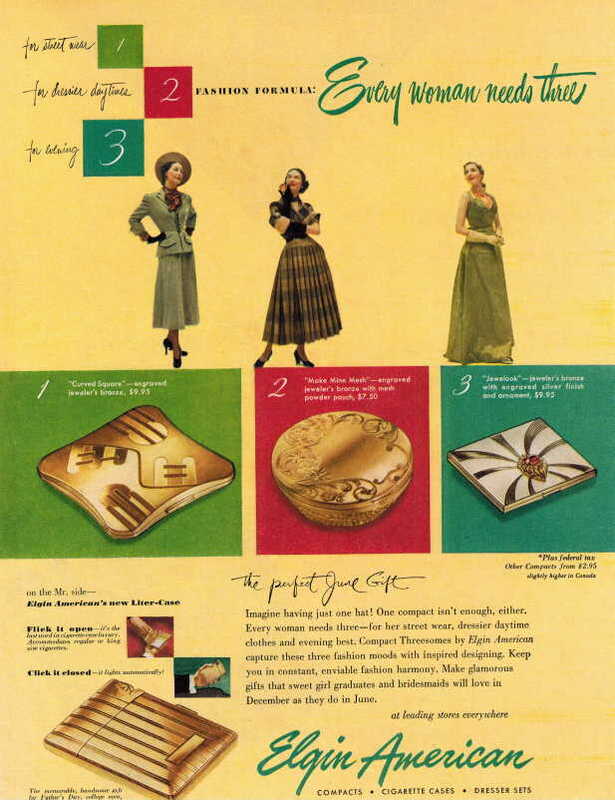 They were known for their quality enamel deco compacts, carryalls and lighters. 3" round gold tone unused Evans compact. The top has raised gold lines with a center area of large multi colored pastel prong set rhinestones! All the rhinestones are secure and bright in color. 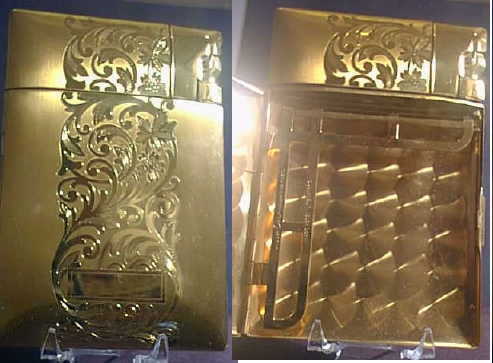 The inside has a mirror and the opposite side has the section for the loose powder with sifter, Evans paper and Evans puff. Fun 1940s compact! 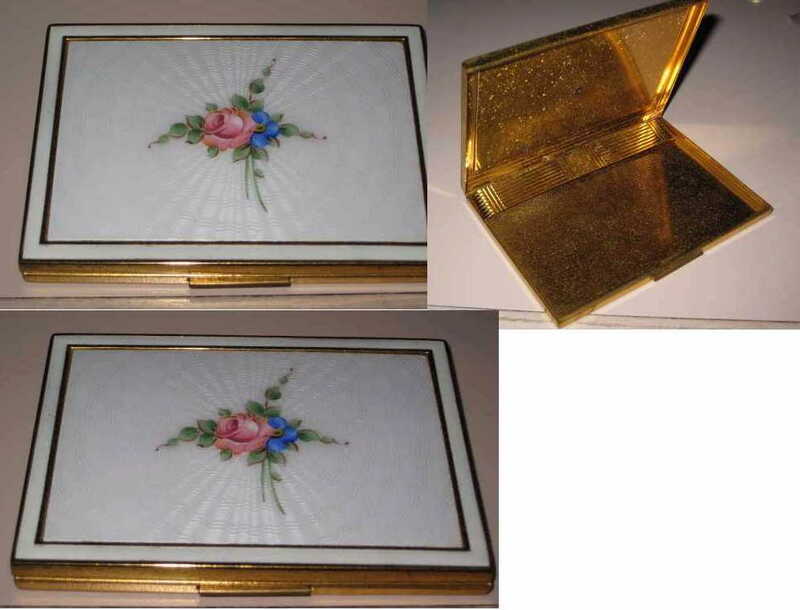 A fun Evans 4-1/4" x 3-1/8" 1930s cigarette case! It has bright white guilloche enamel with a pink flower with blue and green leaves. The back is gold tone. No damage to the enamel. The inside has the small lift up piece that would have held the 1930s smaller cigarettes. Today this would be perfect for business cards or credit cards! It has the Evans logo on the inside. I've seen the matching compact and lipstick so this might have been sold as part of a set. 2-1/2" gold tone rounded square Evans compact. The top has shiny black enamel with gold crown and white and red enamel accent colors. The back is gold tone. The inside has a mirror on one side and the lift up section for powder, empty, no puff. Sweet 1930s compact, no damage. 2" square silverplate with rounded corners Evans deco enamel compact with chain and finger ring! Nice design in the silverplate on the front and back. The center has a rectangular shaped green, brown and black enamel piece. The inside has a mirror and rouge on one side and powder section on the other, no puff. It's marked Evans on the inside. Sweet 1930s deco compact. 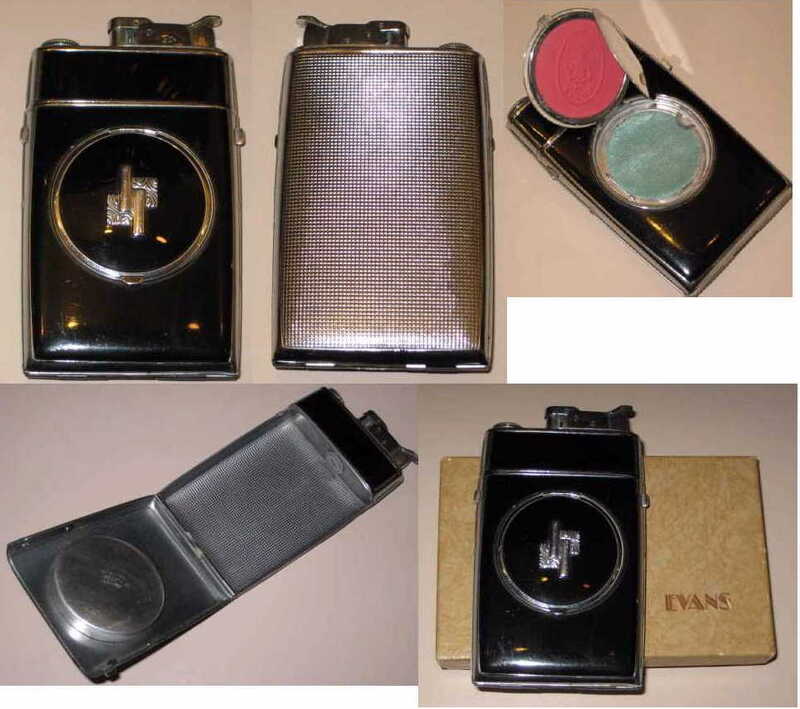 4-1/4" x 2-1/2" silverplate unused Evans black enamel compact, cigarette case and lighter in the original box! The front only is black enamel with a center compact lift up section that reveals the metal mirror that opens for the unused rouge (embossed Evans). The opposite side has the lift up section for the loose powder, with puff. The center of the compact has a deco silver design in the middle. The sides of the case have push buttons on either side that push so the cigarette case pops open. The back is all silverplate. The top section has the lighter. It's signed Evans on the inside. No damage to the enamel. It has the original Evans box along with the original Evans paper brochure on the inside explaining how to use the lighter! This compact appeared in a 1932 advertisement. Nice figural practical compact and cigarette case! A fun Elgin American shell shaped compact! It measures 2-3/4" x 3" and has a nice yellow finish to it on both sides with a line design to look like a shell! No wear to the yellow finish. The inside has a mirror on one side with Elgin sticker that says 14 karat gold plated. The opposite side has a lift up section for the loose powder with signed puff. It also has a lift up section for the rouge, still there, no puff. Sweet 1930s compact! 2-1/4" silverplate compact in a coin motif! The front has profile of a mans head surrounded by stars. The back side has an eagle with a star border. The inside has a mirror on one side with a decal that says "Hotel Sahara Las Vegas." 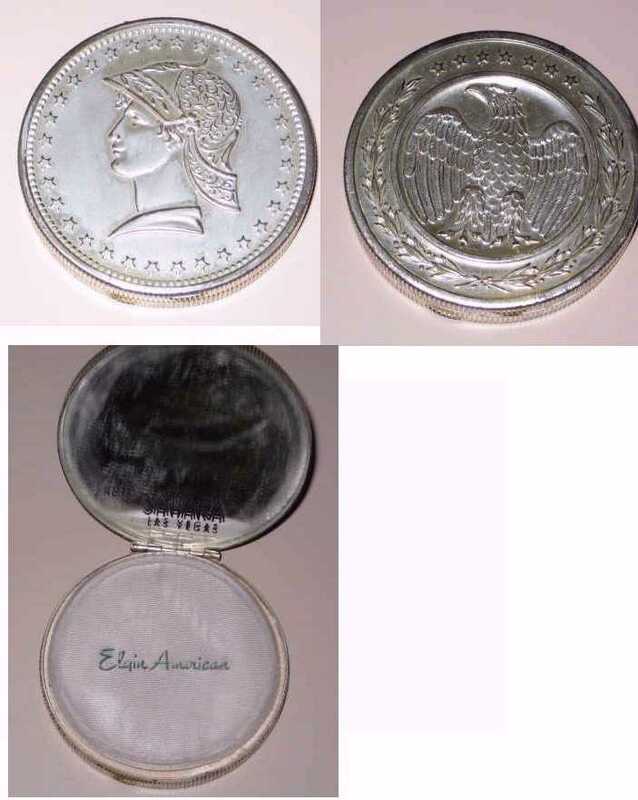 The opposite side is for loose powder and has the original puff with the Elgin American name on it. Obviously a souvenir from sin city! The silverplate is in top condition, very little surface wear. Fun item!